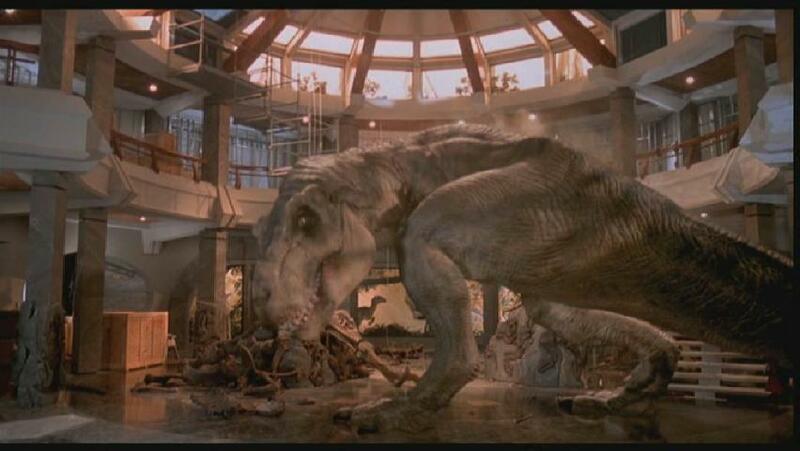 A large, adult female Tyrannosaurus rex was to be the star attraction at John Hammond‘s Isla Nublar resort, Jurassic Park. 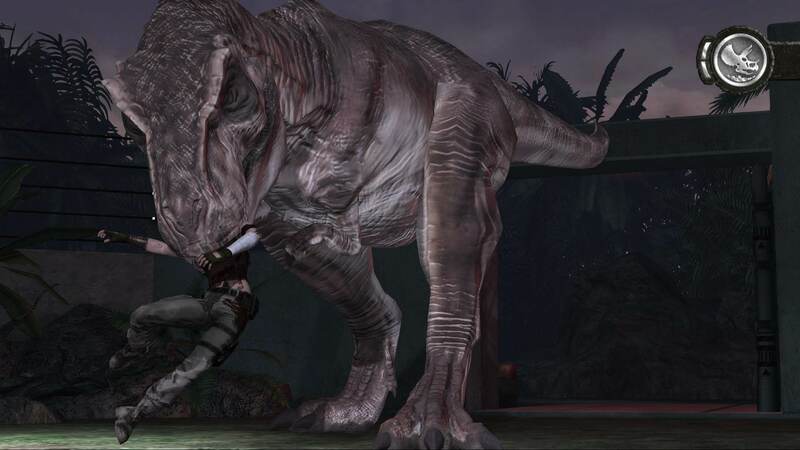 She’s popularly known as “Rexy” with origins from the novel and is used widely by the fandom. 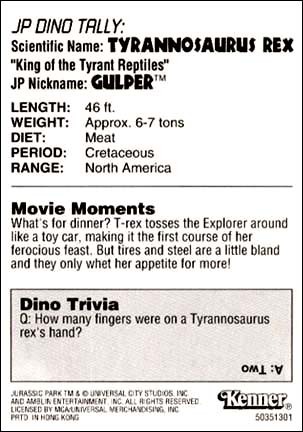 Another nickname can be found in the toys with the name of “ Gulper”. The shooting scripts however refer to her as “Roberta”. 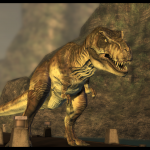 Although sources for size estimates varies, being roughly sixteen feet at the hip and somewhere around forty feet in length, this Tyrannosaurus was one of the larger specimens that InGen produced, her head alone similar in size to a 1992 Ford Explorer. 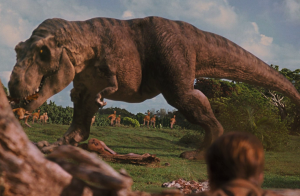 Jurassic World size charts indicate that she is about forty-four feet in length. When the inspection team constituting of vertebrate paleontologist Dr. Alan Grant, paleobotanist Dr. Ellie Sattler, chaotician Dr. Ian Malcolm, lawyer Donald Gennaro, and John Hammond’s grandchildren Lex and Tim Murphy took a tour of the Park, the Tyrannosaurus was initially a no-show. Although computer technician Ray Arnold attempted to lure her to her paddock fence by tantalizing her with a goat, however the Tyrannosaurus still refused to answer the call. source of the light. Now confident that the light was coming from inside the Explorer and that there were interesting objects inside, she set to attacking the mysterious vehicle in front of her, searching for a way to get at Lex and Tim. 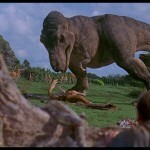 Thanks to the efforts of Dr. Grant and Dr. Malcolm, the T. rex was briefly distracted. The Tyrannosaurus followed fleeing Dr. Malcolm toward the restroom hut, injured him as he was flung into the building and ripped apart the cowering Gennaro while Dr. Grant rescued the kids inside the car. 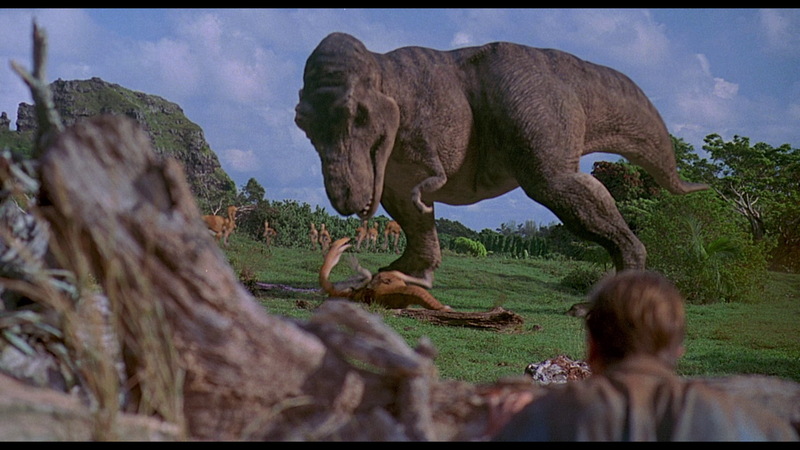 Before long, however, the T. rex returned and pushed the vehicle over the cliff while Tim was still inside. 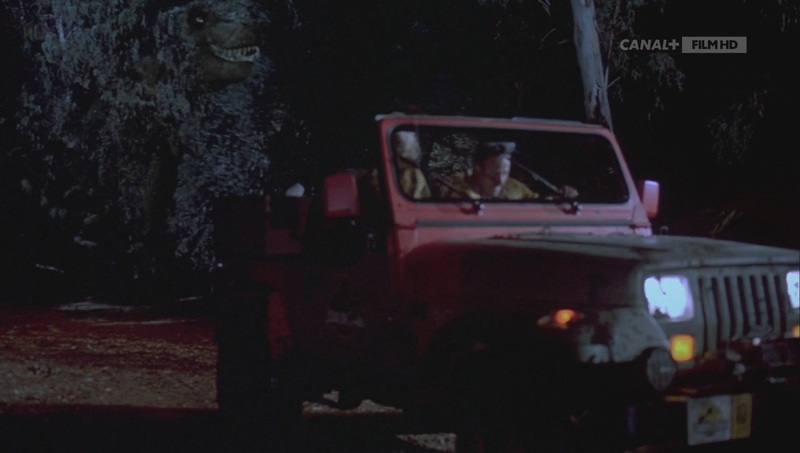 After Dr. Grant rescued Tim from the tree, the two with Lex, began their trek back to the Visitors’ Center, Park game warden Robert Muldoon and Dr. Sattler arrived at the Tyrannosaurus Paddock to retrieve those who had been stranded there only to find a the Tyrannosaurus‘ mess. Acting quickly, the two began searching for the group and calling out their names. At the site of the collapsed restroom hut, Muldoon and Dr. Sattler found the remains of Genarro and recovered Dr. Malcolm who was injured but alive due to his quick thinking to reduce bloodloss by using his belt as a tourniquet. 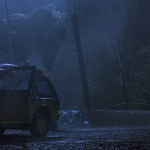 After loading Dr. Malcolm into their Jeep, the two took one last sweep of the area, Dr. Sattler spotted the ruined hulk of the second tour car the Tyrannosaurus had pushed over the cliff adjacent to her Paddock. Although Muldoon and Dr. Sattler did not find Tim, Lex, or Dr. Grant, they did find their shoe prints in the mud, which told they were alive. When the two returned to the guest jeep, the Tyrannosaurus crashed through a line of trees and began chasing the three along a service road. After a very close chase, the Tyrannosaurus was unable to pin down her prey and so gave up her pursuit. The next day, as Grant’s, Tim’s, and Lex’s trek continued, they found themselves in the Gallimimus Paddock, and witnessed the Tyrannosaurus hunting the herd of Gallimimus. After watching in amazement for a while from behind a fallen log, Lex begged Dr. Grant for them to go, to which Grant obliged. However Tim continued to stare in fascination and so had to be forcibly taken away by Dr. Grant. The Tyrannosaurus was seen later that day when she had come through the hole in the wall, and grabbed a Raptor from mid-air just as it was to pounce on the humans, and crushed it in her jaws. Using the distraction the T. rex provided, the humans fled. 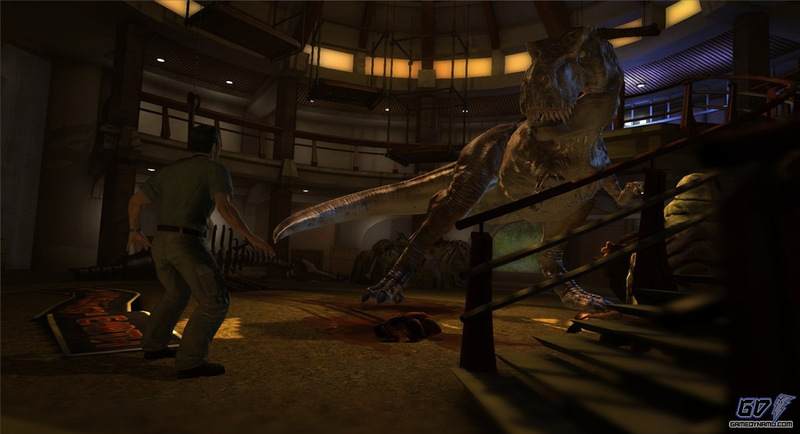 Meanwhile, the Raptor that had pursued the group through the Visitors’ Center foolishly attacked the larger theropod. The T. rex snapped at her, but could not reach her. 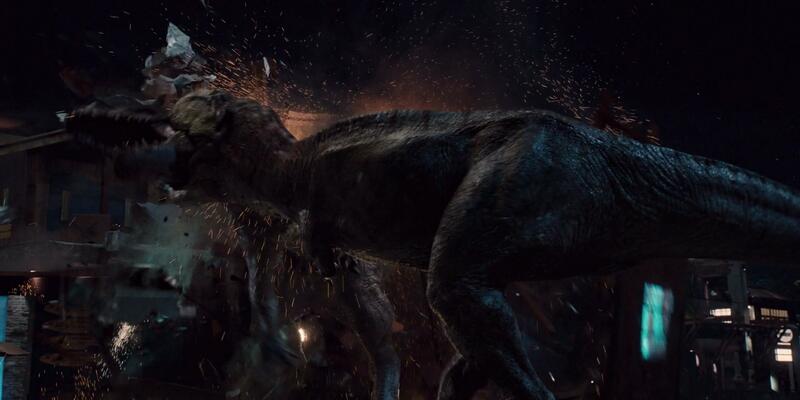 Rolling her head, the Raptor fell into the T. rex’ mouth where she was killed and than thrown against the Tyrannosaurus skeleton and the T. rex let out a mighty bellow. 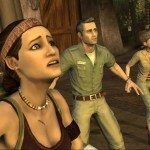 (Element of JP:TG) Soon after, Dr. Gerry Harding, his daughter Jess, and corporate spy Nima Cruz reached the Visitors’ Center unaware that the surviving cast of the movie had just recently fled the island. Once inside, Dr. Harding heard a radio trying to contact them. Locating it, he spoke with Dr. Sorkin, who helps cure Nima of her ailment. 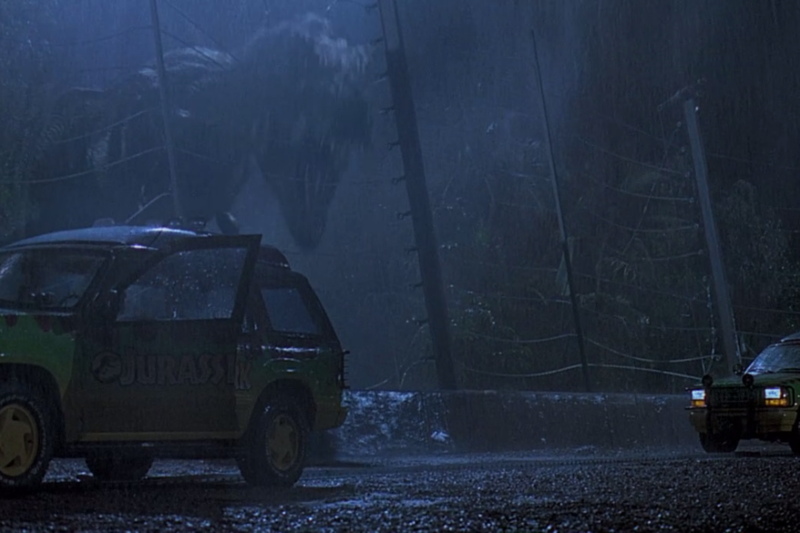 The T. rex attacked once again, forcing the trio to avoid it as best they could, eventually managing to lure it away with the help of the tour vehicle. 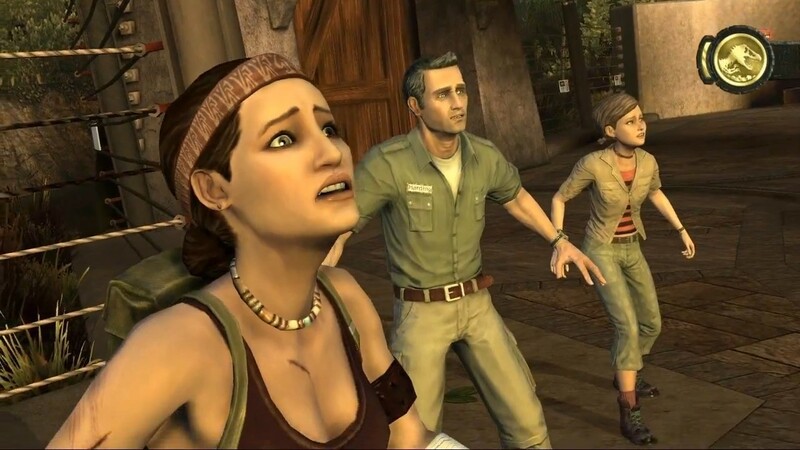 After a second mercenary team landed on the island to rescue those who had been left behind and retrieved the survivors, the group headed back to the helicopter, but found that the mercenary Danny Cafaro had disappeared. 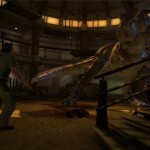 The T. rex reappeared and made her way towards them, forcing Oscar Morales to fix the chopper himself. They managed to get into the air just in time. After a failed attempt at rescuing rogue genetic scientist Dr. Laura Sorkin from her research lab on the north end of the island, the group made their way to the North Dock, the trio eventually met up with mercenary Billy Yoder at the shipping dock entrance. A confrontation ensued with Nima getting into a scuffle with the mercenary. During the scrap the female Tyrannosaurus stalked into the shipping yard forcing all four of the humans to freeze in their positions. The T. rex started to sniff at Jess when her father gently nudged the cryocan with his foot causing it to roll toward the dock’s edge. In a momentary lapse of judgment, Yoder scrambled to save the can before it fell into the water. Although he had saved the can, he had caught the attention of the large theropod. The Tyrannosaurus only hesitated a moment before it engulfed the man with its jaws and lifted him in the air to consume him. Yoder dropped the can. 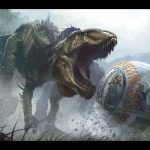 With the T. rex back turned to them, Nima raced to retrieve the can, the Hardings followed closely behind. 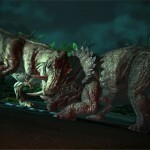 The T. rex was alerted to the movement behind her and stomped after them. Nima and Jess squeezed into shelter while Dr. Harding was left outside. 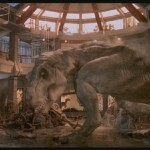 Dr. Harding then attempted to distract the T. rex in order to keep its attention away from the two ladies. 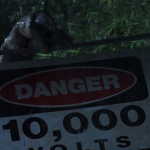 The T. rex damaged the bridge platform the pair was standing on flinging Jess over the edge. 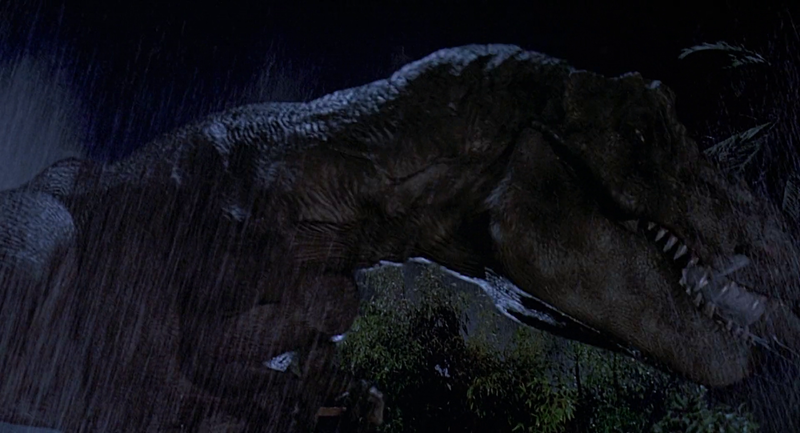 She manages to keep herself from falling off the bridge together, but was dangling mere feet from the Tyrannosaurus. 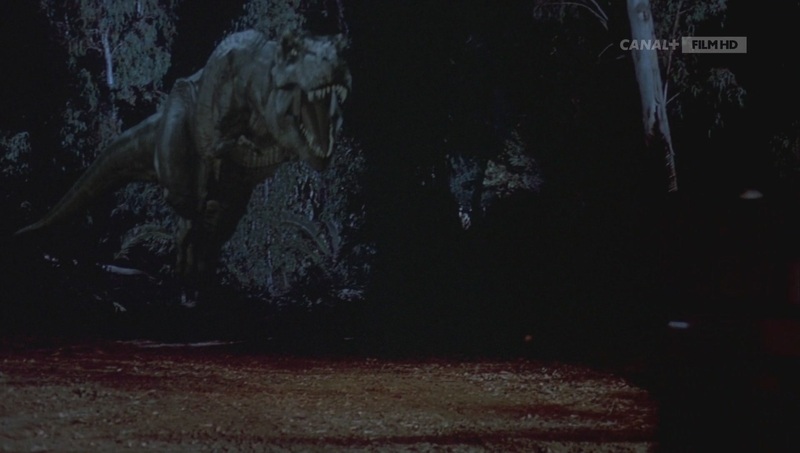 She pleaded for Nima’s help and is saved from the jaws of the predator at the expense of the cryocan that was crushed by the approaching T. rex. 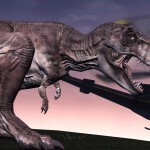 Dr. Harding, while the T. rex had turned to face Nima and Jess, grabbed a steel pipe. He swung the pipe into the Tyrannosaurus leg, successfully gaining its undivided attention, thus allowing his companions to escape to the last remaining boat at the end of the docks. 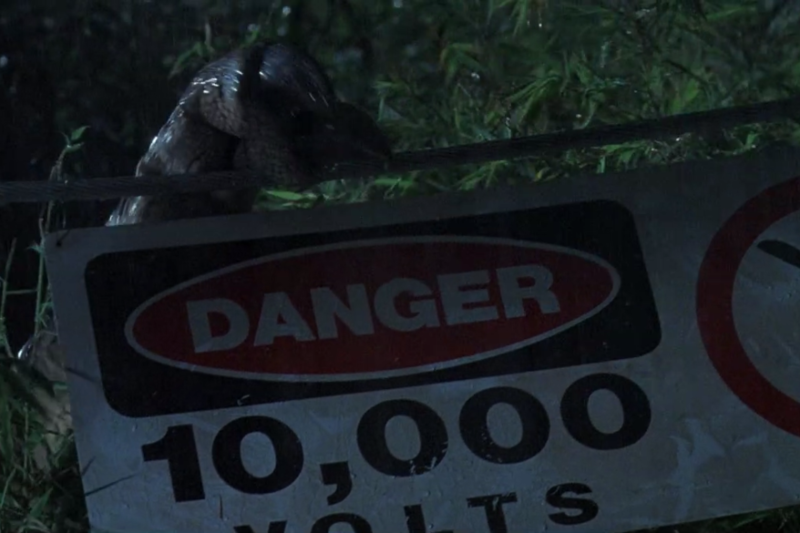 Dr. Harding scrambled through the container yard, the large theropod hot on his heels. Dr. Harding eventually found cover inside an animal cage. The T. rex couldn’t reach the man with its jaws due to the small opening at the end that was suited for caging smaller, man-sized dinosaurs. Frustrated, the animal thrashed about and finally flung the cage toward the pier that the small boat was located. This same Tyrannosaurus rex had been on Isla Nublar for over 25 years. 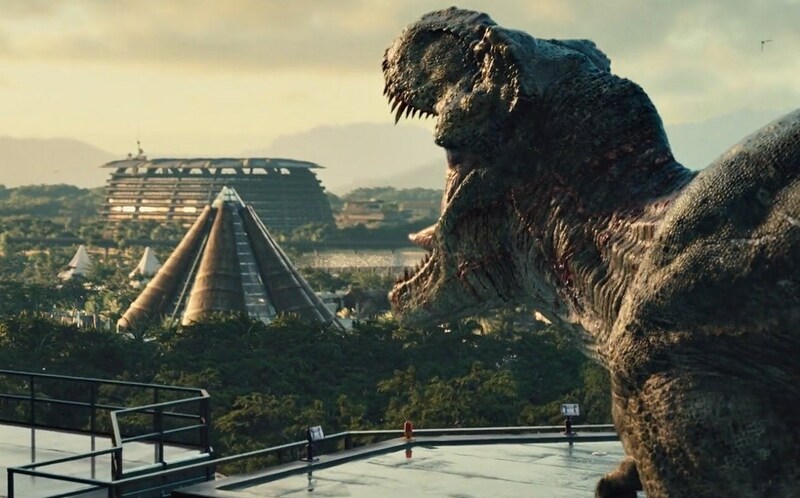 At the Jurassic World theme park, she’s located in the T. rex Kingdom. Living in a small enclosure officially named Paddock 9 adjacent to the Innovation Center, the T. rex was lured to goats with flares as visitors looked on from an especially large log designed to camouflage in with the Redwoods mimicking habitat. When the Indominus rex‘s devastation finally reached the Main Street, Claire Dearing had Lowery Cruthers release the Tyrannosaurus at the suggestion of her nephew. Luring the elderly carnivore to the paddock entrance with an emergency flair, Claire led the Tyrannosaurus out to the Main Street and tossed the flair at the Indominus. 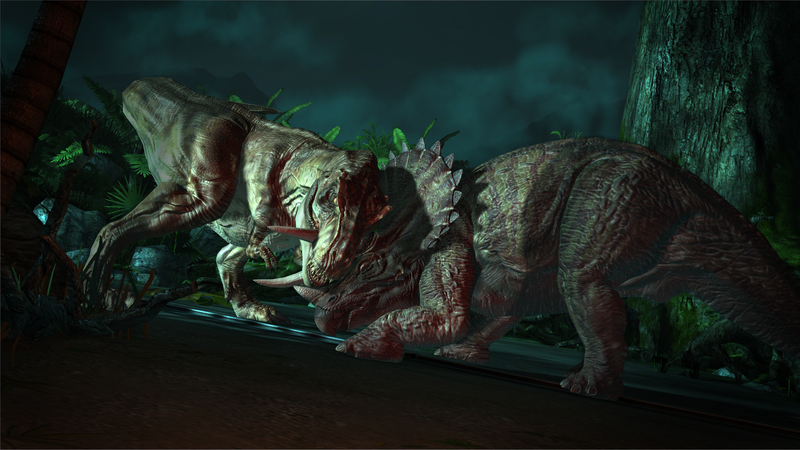 The T. rex, smashing through the Spinosaurus skeleton, quickly engaged the Indominus in a furious battle. Unfortunately, the old female could not take on the younger hybrid dinosaur and was quickly brought down. 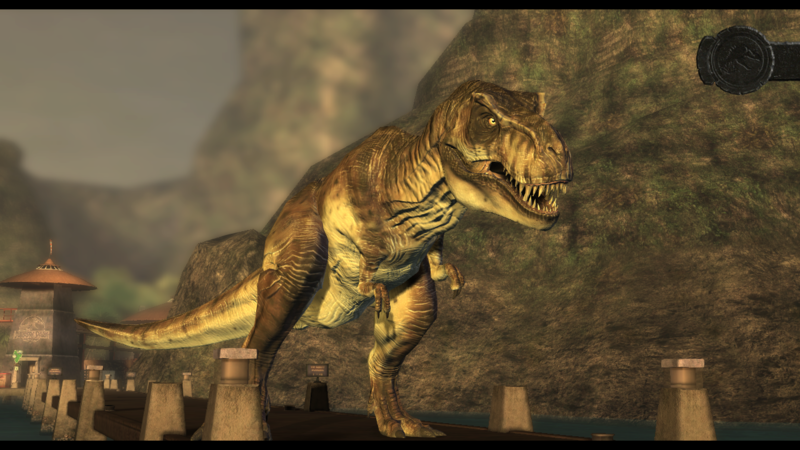 The Tyrannosaur roaring over the ruined park. 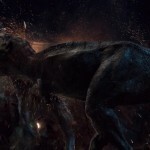 It was only due to the fortunate assistance from the Velociraptor, Blue, that the Tyrannosaurus could gain a second wind and beat the Indominus towards the Mosasaurus Lagoon. There, as the two super predators came face to face with each other, the Mosasaurus burst from her lagoon and dragged the hybrid to her watery grave. The T. rex and Blue gave each other a quick glance before parting ways. 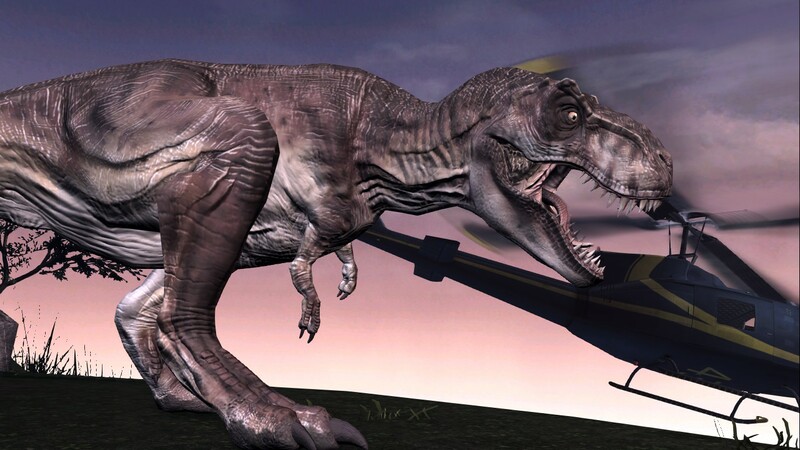 The Tyrannosaurus was last seen on Jurassic World’s helipad, roaring over her kingdom.